Today we woke up to find that the delivery man had dropped off a great big package filled with yarn from my mom and sister-in-law (it was part of a family fund-raiser). In the package of yarn were a few after-Christmas presents, including a cute little toy digital camera. Lizzy immediately seized the opportunity, and continued taking photos for at least an hour; these are a few of the photos she shot. 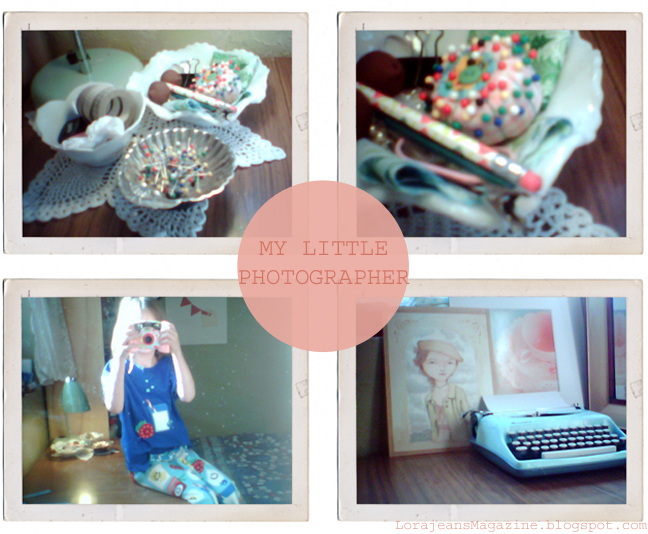 Without any prompting or suggestions, she took some very familiar-looking photos of things in my craft room. (Interestingly, the lower quality of the images kind of makes for a neat vintage-y Polaroid-esque feel). I caught Owen doing the same thing after I took pictures of the boys' gingerbread houses. He got a spy watch with a camera on it for Christmas...and monkey see, monkey do...about 20 of his pictures from Christmas day were of the gingerbread houses. It still makes me smile.